Jean-Pierre Jeunet’s beautiful and fantastical romantic comedy is about a sweet girl who devises extraordinary ways of bringing cheer to the needful and happiness to herself. The film is an absolute joy to watch, warming your heart and making you laugh many times. Audrey Tautou plays Amélie in her career-defining role. We defy you not to fall in love with her. 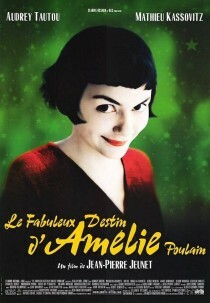 We vote Le Fabuleux Destin d’Amélie Poulain our favourite film of all time. Not to be missed! You can find more information on this French-language film on Wikipedia and IMDb. This is also one of my all time favorites! A gorgeous little film and high on my list. Much lighter than Delicatessen! One of the best films of 2000’s, possibly even of all-time. A unique story that will capture your imagination and heart until the very end. Ik kijk films niet vaak, maar deze heb ik toch zeker al vijf keer gezien. Blijft geweldig! De muziek ook, overigens. Yann Tiersen is een goede gast. Dit is mijn favoriete film ooit! Wat een heerlijke film! Una de las mejores películas que he visto. Te engancha el corazón y te deja un sabor de boca maravilloso! !